LOVE HOW YOU PRESENTED THIS ! Excellent series of shots. I've always enjoyed taking photos out of the plane window. Nice montage of your flight -- looks like you went from cold to warm. Well done. Gives a whole new look to the term "travel photography"! Great view of your flight. 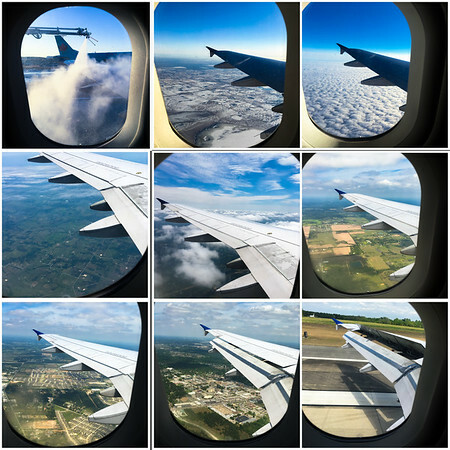 I agree; I love window seats in airplanes; they provide for not only viewing the landscape below and an up-close view of the cotton ball clouds, but sometimes the photo oops are endless. Fantastic montage of your flight. Not sure how keen I'd be about watching the wings being de-iced before take-off, though. Really tells the story of your flight! Excellent work!